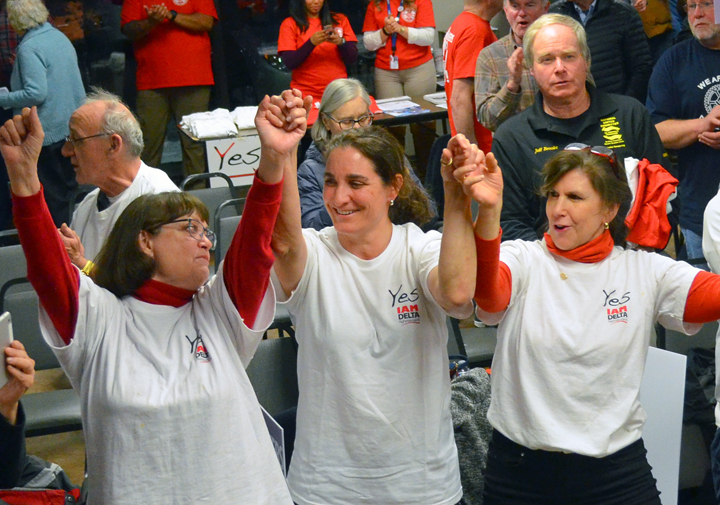 Delta workers cheer during a union rally at the St. Paul Labor Center earlier this month. One of the largest union organizing drives in the world touched down in St. Paul earlier this month, as baggage handlers and flight attendants rallied for a voice on the job at Delta Air Lines. Although the two groups, which include a combined 40,000 workers, are organizing separately, both have enlisted the support of the International Association of Machinists. The union represents more than 100,000 airline workers. Union supporters at airports across the country are collecting signed authorization cards from their Delta co-workers, hoping to trigger elections with the National Mediation Board soon. Organizers estimate some 3,000 Minnesotans would be eligible to vote if both flight attendants and baggage handlers file for elections. Since acquiring Northwest Airlines a decade ago, Atlanta-based Delta has maintained a strong presence at Minneapolis-St. Paul International Airport. But the company also has maintained its record of union avoidance. Many workers at the rally began their careers with a union contract at Northwest. Bob Cannatelli, a Boston-based flight attendant, drew loud cheers when he talked about “getting back what we lost” when Delta took over. It won’t happen overnight, Cannatelli acknowledged. “But what will happen the moment we certify is a seat at the table, a voice, mutual respect, just cause – no more at will – and defined discipline that will prevent the favoritism that we all see so much,” he said. 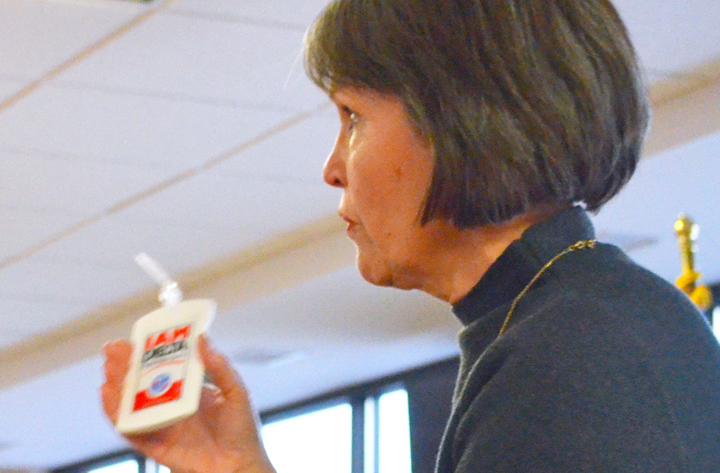 Rep. Betty McCollum shows the pro-union luggage tag she uses whenever she flies Delta. The rally drew a standing-room-only crowd to the St. Paul Labor Center, but Delta workers weren’t the only ones in attendance. Elected officials, members of other unions and retirees rallied in solidarity. 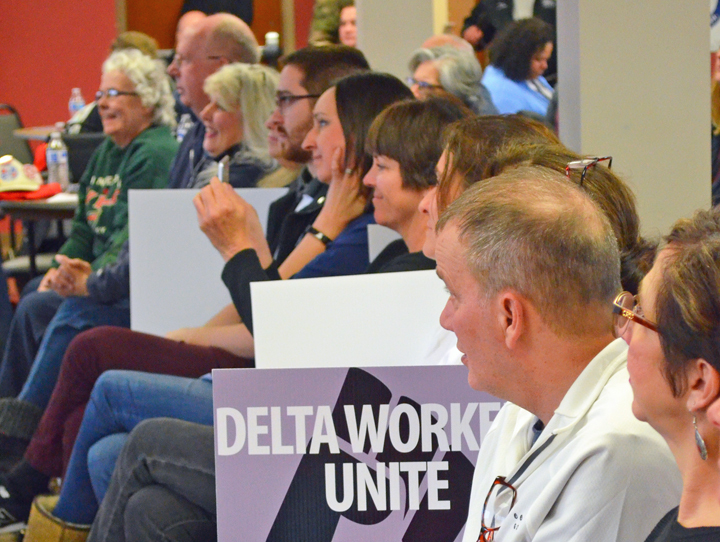 Rose Roach, executive director of the Minnesota Nurses Association, noted the similarity between concerns Delta workers are raising in their organizing drive – like sufficient and safe staffing – and the challenges MNA nurses face in hospitals and clinics across the state. Rep. Betty McCollum, a DFLer from Minnesota’s 4th Congressional District, held up a luggage tag with the Machinists logo on it and said she attaches it to her bag each time she flies back and forth from Washington. Delta’s lobbyists approach her regularly, McCollum added, and she reminds them each time that she supports its workers’ freedom to a fair process in deciding whether or not to unionize. Delta failed to live up to those standards, unions allege, in a series of narrow workplace elections after the 2008 merger. In the fall of 2010, flight attendants voted 51 percent to 49 percent against union representation with the Communications Workers of America. Baggage handlers and passenger service representatives rejected Machinists representation by similarly narrow margins. Both the CWA and Machinists accused Delta of running an illegal campaign to intimidate and harass its employees into voting “no” – bribing workers, monitoring them with surveillance and meddling in the secret-ballot process. Workers at the rally warned that the company will use the same playbook this time around.